I wanted to chat with you about something personal, uncomfortable, and raw. Jealousy. If we’re connected on Facebook, you may have seen my recent trip to the South of France. Were you excited about the possibilities that you can reach in your own life…or did you possibly experience something less pleasant? With all the pictures and videos coming out of France, I’m well aware that it can get annoying…because I’ve felt that way too. Several years ago, I actually unfollowed and even unfriended people who were experiencing too much success. But I’ve since learned that when you experience jealousy, you have two options. I earned a lavish trip from my company and my husband and I were treated like celebrity A-listers on our week-long adventure in France. My team and I worked incredibly hard for this and it took me years to reach this milestone, but I was aware that if I overposted, I would be in danger of triggering jealousy from the very same women that I love and serve on a daily basis. I know this because not that long ago, I was that woman who experienced pangs of bitterness when I saw another woman experiencing “too much” success. Listen, my friend, there’s always going to be someone in the room (or in the Facebook feed) with a lifestyle that could trigger your jealousy. I’d like to make a distinction here that jealousy isn’t quite the same thing as envy. Envy means that you want what they have. Jealousy creates resentment and even bitterness toward the person while wanting what they have. I used to see woman earning income, gifts, and perks from their businesses that triggered a bitterness in me that I wasn’t proud of. Every once in a while, we’ll see something that ignites a jealous fire. Because it’s a reflection of us – of our fears, of our inadequacies, and of our desires. Perhaps it’s because we KNOW we are capable of achieving it. Of having it for our own. But jealousy is a chameleon. For starters, we don’t often recognize it as jealousy at first. It feels like a dislike of the other person. I don’t know why I just don’t like her. It can leak out as spiteful comments or thoughts. At first, she might be doing well and you’re happy for her. I am so proud of you, girl! Keep rocking it! And then she starts doing really well. Wow. That’s amazing, how are you doing it? Then she’s rocking it like a boss. And… the feelings here might get complicated. We start to think someone’s gotten a little too big for their britches. On a high horse. A show off. 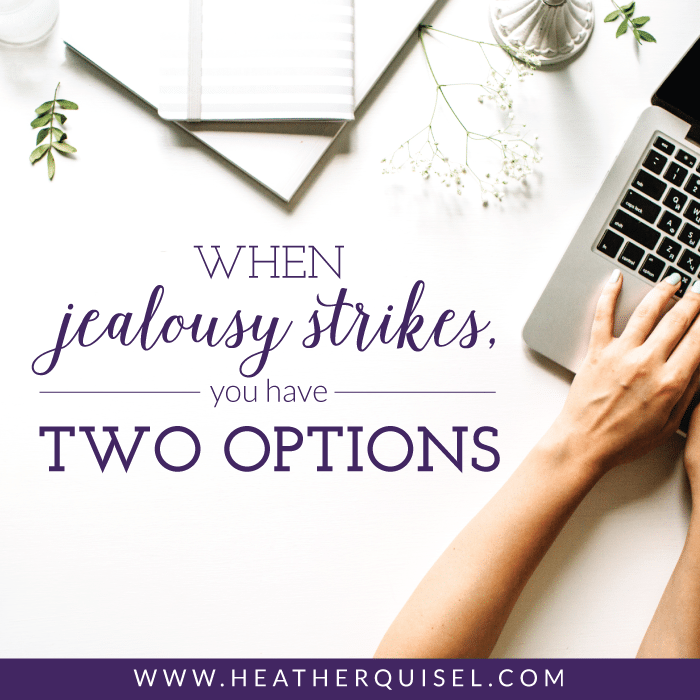 When Jealousy strikes and bites, you have two choices. One will poison you. One will set you free. Turn off the newsfeed. Protect your mental health and don’t allow yourself to become poisoned. Turn on the newsfeed with a new mindset. There’s a way to recognize and acknowledge your envy and allow it to drive you into a state of positive motivation. Realize that you are capable and ready to achieve and receive and that these things and experiences that you’re seeing are simply a preview of what’s to come in your own life. Envy can also be a guidepost of the things that you truly want in your life that you haven’t yet recognized. You can use it as a tool and allow it to work for you, rather than against you. Turning it off or turning it on? Neither of these approaches is wrong. But what has worked for me and my clients is fixing your mindset so you can get to the focused ACTION that propels you to your new life. Okay, Heather. You might be saying to yourself. But how the H. E. Doublehockeysticks am I going to feel grateful when I’m up to my eyeballs in raging jealousy?! So, I want you to pay attention. When jealousy and envy start whispering to you (or shouting at you! ), it’s time to use those emotions to drive you to excel…to push yourself. Rather than spending your precious emotional energy in a tailspin about what you don’t have or imagining that you can’t achieve, let these feelings fuel your fire and make these dreams happen in your own life. This is what has truly worked in my own life. Without being in a negative place of bitter comparison, release the energy of seeing what you want to move you toward action. Intentional action will bring your dreams right to your door. Someone will always be in First Class. Those in First Class might be jealous of someone in a chartered plane. The chartered plane folks dream of their own private jet. For the record, I am NOT advocating greed or unbridled dissatisfaction for all the blessings in your life, but I am advocating dreaming big and being grateful during the whole process. Have gratitude for what is and what is coming to you. Gratitude will not fail you. That future is already yours. You just need to learn how to step into it.